We would like to thank you for supporting the Headquarters for Hindquarters Bull Sale the past 22 years. As we communicated in a previous letter, Juliana and I decided to discontinue the annual joint bull sale with our good friend Bobby Grove due to the expense, time, and commitment it requires. 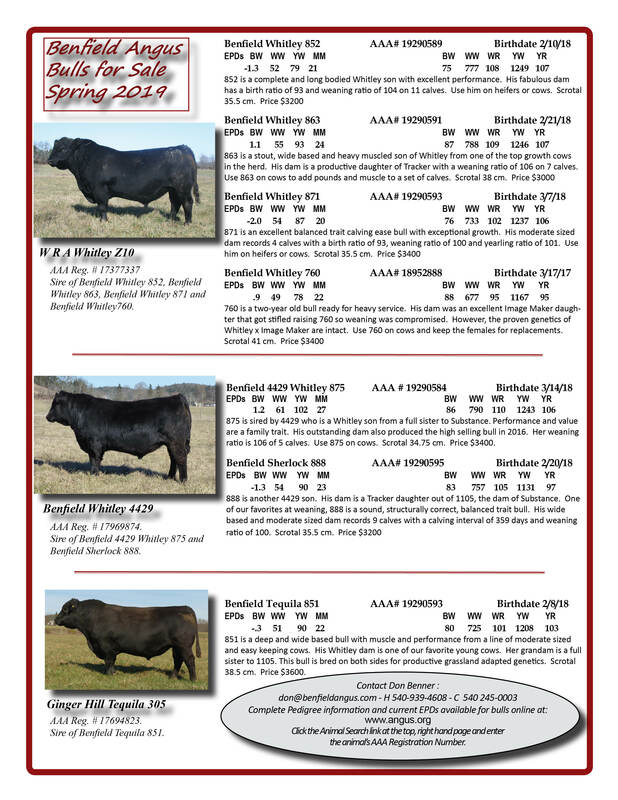 Consequently, we will offer this year's bulls on a first come basis this spring off the farm. Information and pricing of the bulls are noted on the reverse side. We made several changes in our bull program. First, we plan to be more selective in the bulls we offer for sale. This will reduce the number we have available, at least for the immediate future. Second, the bulls are performance tested in a large pasture on a ration of free choice long stem hay with a limit-fed commodity based pellet for additional energy. The ration was formulated to provide approximately 3 lbs./day gain. Consequently, the yearling weights are less than previous years but the slower development is preferred for the long term condition and health of the bulls. Nearly 50 years has passed since I purchased my first registered Angus females from Hill Crest Farm. Our philosophy has never wavered to expect our cows to thrive on grass and hay. The females must bring in a healthy calf and breed back or they leave. We do not creep feed the calves because it ruins the integrity of maternal records. As we have learned from experience, few lines of Angus cattle are adapted to the heat, humidity and fescue of Virginia. It requires generations of selection pressure to breed true grassland cows. Our cattle fit the environment because we have required it for over 10 generations. We want our cows to look like cows: balanced, big bodied, easy fleshing with excellent udder quality. We want our bulls to look like bulls: masculine, wide based, heavy muscled with large well-shaped testicles. We keep pressure on the necessary production traits of fertility, longevity, udder quality, disposition, structural soundness, growth, calving ease, production efficiency and fleshing ability. The bulls are ready to go. Give us a call. Copyright 1999 Benfield Angus. All rights reserved.